Material: Hand cut genuine lead crystal glass. 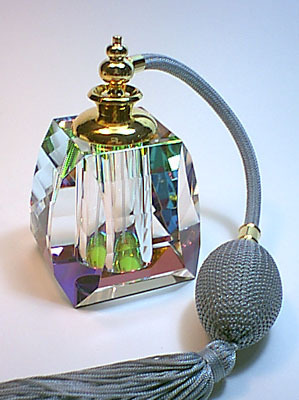 Capacity: 20 ml Size: 65 mm x 65 mm x 116 mm (2-1/2" x 2-1/2" x 4-1/2") Finished: Hand cut lead crystal glass in iridescent with 25k gold plated brass collar and fits with silver squeeze ball and tassel spray mounting. Feature: Perfume refillable. Premium and unique present suitable for all occasions. Small funnel attached and packed with cardboard gift box.